Many of us struggle with our body image. 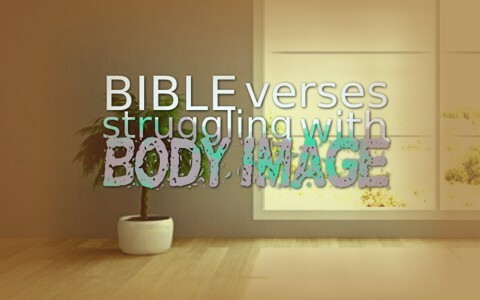 God sees the inside while mankind looks at the outside so here are 7 Bible verses for those who struggle with the way their own bodies look. I think many of us struggle with the way we look. If we only understood that God made us the way we are we might think that other’s expectations and our own isn’t important. The way that God sees us is the most important thing of all because God doesn’t look at the outward appearance the way that we or others tend to do. Many people judge us from our outward appearance and not by what is inside. What is inside is what really counts in God’s eyes and in God’s eyes it’s the only thing that’s important. The outward man or woman is not of eternal importance…it is what is inside as Jesus once said “it is not what goes into the mouth that defiles a person, but what comes out of the mouth; this defiles a person” (Matt 15:11) so we must keep our focus on what really defiles a person and it’s not what’s outside that does it but what comes out of the person’s mouth for that reveals what’s in our hearts. What others think is nothing…what God knows is everything. When Samuel was seeking who would be the king of Israel, He had all of Jesse’s sons pass before him and time after time, Samuel thought that surely one of these young men would be the next king. Some were tall and muscular but that was not God’s standard. Jesse didn’t call David who was what we might call the “runt of the litter” but God said that He looks not on the outward appearance but what is inside. He doesn’t have regard for what a person’s looks are like but He looks at the heart because the most important attributes of a person are never what we see but the things we don’t see and what we cannot see, God can. That’s all that really matters. Sadly, many people will look at us and judge us by appearances and as we’ve already read, they can miss-read us because they don’t see what’s on the inside which is what is of ultimate importance. Jesus said “You judge by human standards; I pass judgment on no one” (John 8:15). Every time that someone looks at us and they judge us by appearances, they are judging us by human standards and very likely miss-judging us. What they can’t see is what is most important anyway. The religious leaders of Jesus’ day were only concerned with what people saw them doing but God knew their hearts and saw that they were inwardly full of sin. Paul knew that the outward man or woman was perishing, day by day, and as he said “was wasting away” but the most important work was being done inwardly by the Spirit of God and this was the renewal that each believer in Christ is undergoing, day by day. God’s Spirit works to convict us of sin, He works to make us more like Christ, and our sanctification is a lifelong process and even though we might be falling apart outwardly, what is eternal is what is inside and that’s the only thing that counts. We are new creations in Christ (2 Cor 5:17) even though the outward appearance is decaying, so that’s why Paul didn’t want us to lose heart. Jesus knew the heart and since He is God, He knows the thoughts and motives of every human heart for He is also the Creator. God looked at the religious leaders and knew that they were hypocrites because they taught one thing but did another as Jesus said “on the outside you appear to people as righteous but on the inside you are full of hypocrisy and wickedness” (Matt 23:28). They liked to be seen and wanted others to think highly of them but Jesus knew that inwardly they were as dead as could be and were full of all sorts of evil and uncleanliness. It is never what others think about us that’s important; it is only what God knows about us that counts. We might be able to fool others but we can never fool God because “Lord, you know everyone’s heart” (Acts 1:24) “for the LORD is a God who knows, and by him deeds are weighed” (1 Sam 2:3). How true this is. You can put lipstick and earrings on a pig but inwardly they’re still a pig so Peter writes that “the hidden person of the heart” is precious to God and the “imperishable beauty of a gentle and quite spirit” to God is “very precious” and that’s all that matters eternally. We’ll all get new bodies someday anyway and so why should we be so preoccupied with what we look like when God only cares about what we are like on the inside? The older I get the less I care about what others think about me and about what I look like. We are all made in the image of God. Not that we have a body like God because God is Spirit but we have certain attributes of God and they are not about what we look like but about what we think about. God has declared that He made us most wonderfully (Psalm 139:14) and besides, “Charm is deceitful, and beauty is vain, but a woman who fears the Lord is to be praised” (Prov 31:30). It is true that “bodily training is of some value, godliness is of value in every way, as it holds promise for the present life and also for the life to come” (1 Tim 4:8). God has made us exactly the way that it pleased Him and we all must remember that God has chosen the weak and the base of the world (1 Cor 1:27) and what the world considers despised and lowly (1 Cor 1:28) is important to God and that’s all that matters, isn’t it? He looks at the inward parts of the human heart, not the outward appearance, so don’t worry about what the body looks like, be concerned with the things that God sees because in the end, that’s all that’s important and that’s all that really matters. What others think is nothing…what God knows is everything. Thank you Alisa. I am saddened by the “outside” being the all-in-all which it is not. What God looks at is the heart (1 Sam 16:7) and I can sense you have a tender heart for God. God bless you so much my friend. Next post: What Did Jesus Mean When He Said “I Am The Lord Of The Sabbath”?